I got a little bored today and took out the Nikon 50mm lens given to me by dad couple of months ago. There's fungus in the lens and I wasn't bothered to send it for service as I do not have a Nikon Series E camera to use it with. Well, I got bored and did an attempt to disassemble the lens to clean up the lens. The terms I use maybe incorrect as I am not a professional in lens service, this is just to share how I serviced the 30 year old lens on my first try. I took out my precision screw driver and started disassembling the back part of the lens. 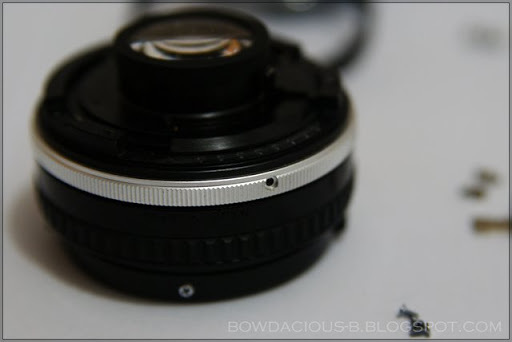 Unscrew 3 screws at the back of the lens mount, and take out the lens mount piece. Next I took out the aperture ring and unscrew 4 screws, 2 screws at each side of the lens on top of a metal piece that limits the ring of the focusing range. Then later, I realized that I disassemble the wrong part of the lens. Holy smokes! 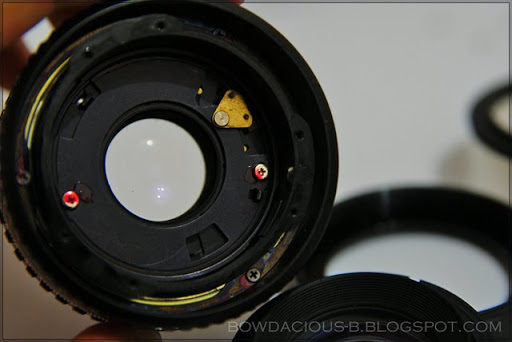 I accidentally disassemble are the mechanical control part of the lens. I decided to assemble it back all together and start again. Back to the start, I disassemble the lens starting from the serial number plate. To unscrew the serial number plate is a little tricky. 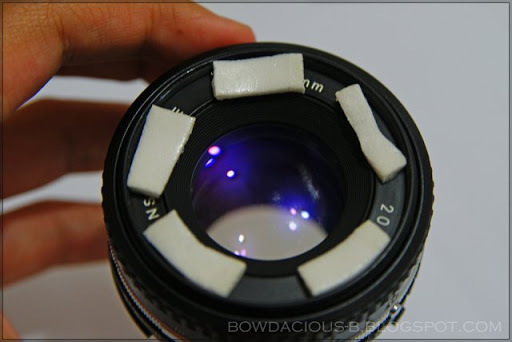 I paste a double sided tape which has foam in between and use the rear cap of the lens to unscrew it. Remove the serial number plate to reveal 3 screws. Unscrew the 3 screws, remove the piece to reveal another 3 screw. 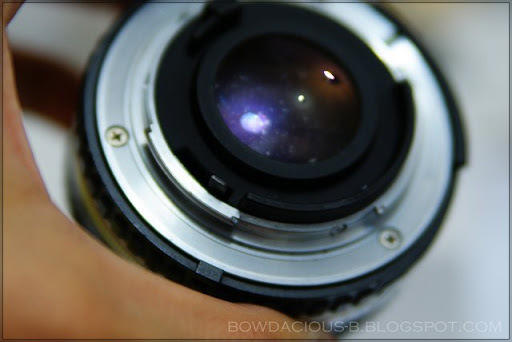 Here, unscrew the 3 screw and take out the front element of the lens. Voila! 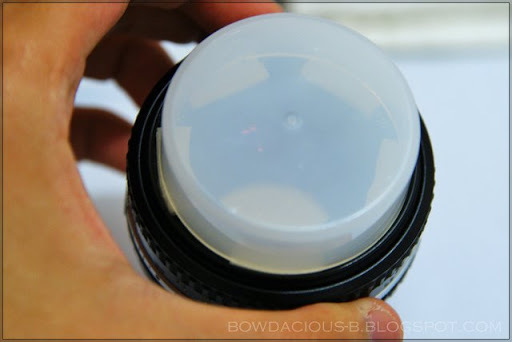 The interior part of the lens is now exposed for cleaning. 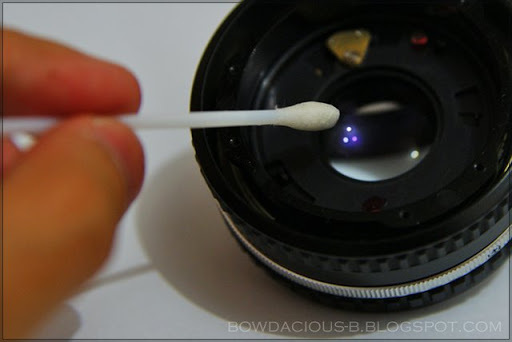 After cleaning the lens, it's now fungus free! 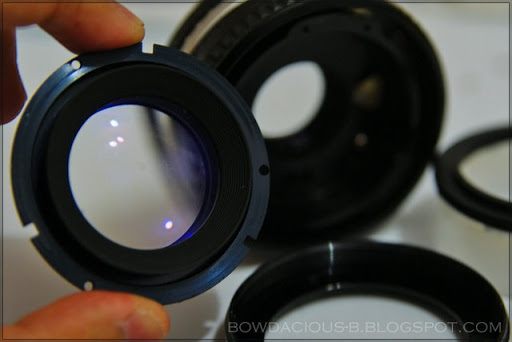 Placing the lens together with my other 50mm lens. 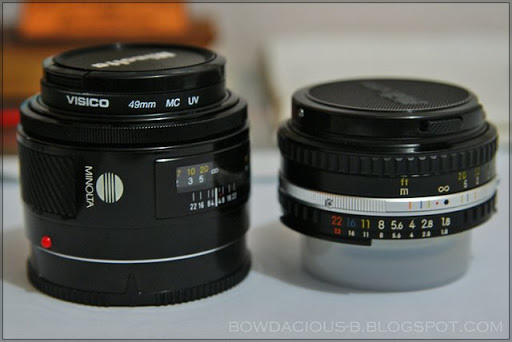 Comparing Minolta Maxxum AF 50mm f1.7 with Nikon Series E 50mm f1.8. You may pop this question out, why would I want to service a Nikon lens when I am using a Sony / Minolta camera system? Reason is, this Nikon 50mm lens manually controls the aperture via the lens itself, it's ideal for Reverse Coupling Macro as I can change the aperture number of the reversed lens easily. My next possible tryout project, to disassemble the Sigma 70-250mm for Nikon Series E. That's if I had a lot of time to spare. This is an extremely useful tutorial. Now I'm tempted to clean a few very old Nikon lenses with fungus inside. Question: what sizes of screw drivers would I need for a similar job? Please be specific since I will be buying these. Thanks. 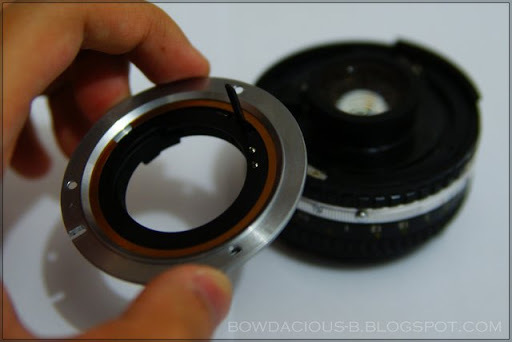 Also, not all Nikon lens has the same method of disassembling. Hi. I cannot remove the serial plate. Can you help? hi.. i was trying to disassemble a sigma (nikon mount) 75-300mm DL f/4-5.6 which looks like your Sigma 70-250mm when i stumbled upon your site. Was trying for ages and i couldn't figure out how to remove the 1st and 2nd elements. finally, i chanced upon peeling away the focussing ring's rubber coating and found that it's just held together by cellulose tape (1st & 2nd element's holder). just thought you'd like to know. have fun! cheers! Dude, the serial number tape bit was ingenious! 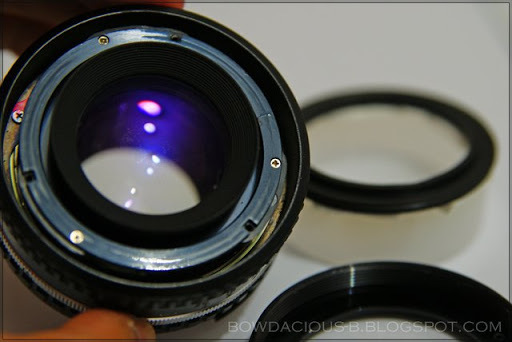 Some lenses (Minolta 200mm F2.8G HS APO) were impossible to open without a "lens opener", which can apply equal pressure on both sides of a ring. I consider the E-series 50mm (and the 28mm) to be quite collectible due to their pancake form. If you still have your dad's Nikon then it makes a nice compact shooter! The Nikon Series-E lenses were made to be an affordable line, I believe released with their consumer grade FM camera body in 1979- though these lenses will mount to any Nikon camera... 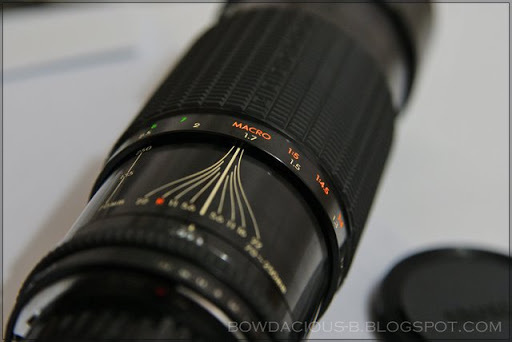 I use this lens on my new Nikon D90 DSLR and get stunning results. 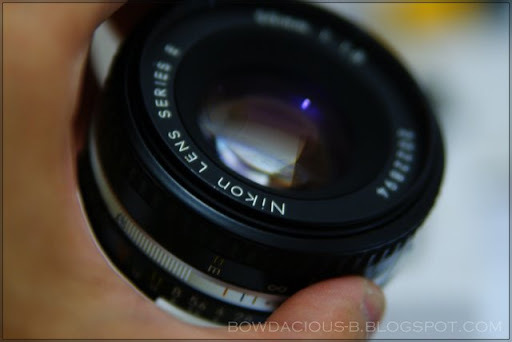 Your lens is the slightly more desirable upgrade from 1981 when Nikon used a metal aperture ring instead of plastic. 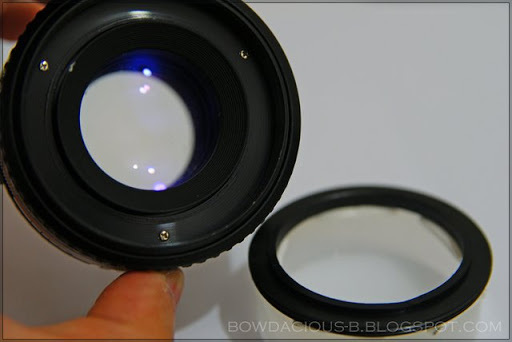 But... this lens design is very simple compared to most others. The Nikkor series lenses are more complicated and you'd be in for a few more surprises. I say this because it might not be worth while trying a repair like this on a $200 Nikkor even though it's perfectly reasonable on a $50 Series-E. Just some thoughts. Turn counter clockwise to remove the serial plate and stick the tape firmly. Thanks Markus, that's a great site you have their! I collect DIY photo links since before 2000, and since ~ 2001 I publish them - first mostly for me to have my DIY bookmarks everywhere. 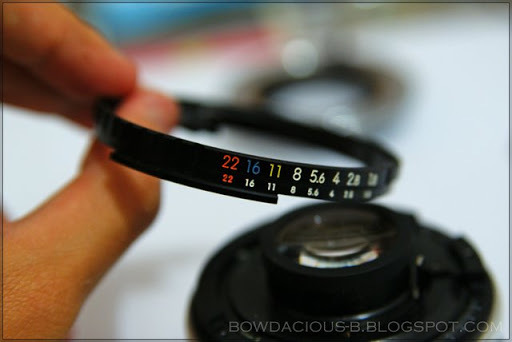 Great, it's helped me a lot to disassemble my 35mm Series E.
Thanks for this post. Helped me a lot cleaning up my 50mm 1.8 series E, that I pimped up with a Dandelion chip. Works great. Hi Benjamin, first excellent tutorial with pics! 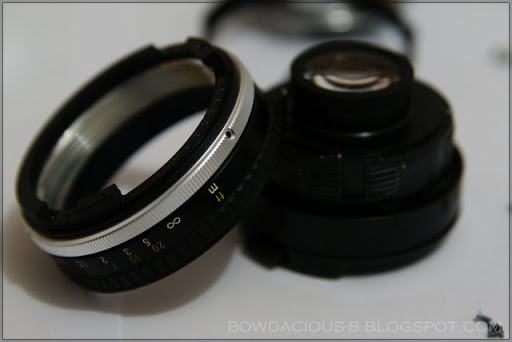 Now, the focus ring of my nifty fifty is tight, should I start to take it apart from front or lens mount? Start from the front, there's nothing much which can be accomplished by taking out the rear. Remember the steps as assembling it back would be tough. If it's the focus ring that's tight, you need to go from the back. I've actually done a couple of articles on my blog. You can check them out HERE and HERE. Thanks also to Bowdacious for this very nice page; it helped me open the lens from the front. Great liitle tutorial! Have been wondering what is involved, this has given me a great base to start from. Will tackle a nikkor 35-70 zoom I have that has fungus. Thaks a heap for taking the trouble to post this! Good idea; regarding the double sided tape to remove the serial plate. I've modified a few Ai 50mm's for use as a DIY tilt lens, but I couldn't quite work out how to remove the front element, til now. Thanks for posting! A high performance Camera Lens can transform your photography. 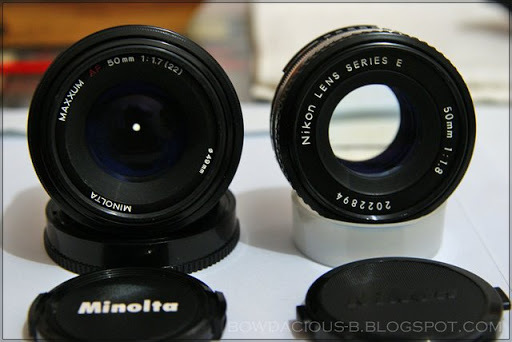 Find digital camera lenses for Nikon cameras. Buy discount nikon lenses for the best prices in Australia. GREAT INFO! I just bought a Z6 and my old Series E 50mm 1.8 lems works! But, it's 30+ years old and has fungus. Now I can clean it and use it!!!! Bowdacious-B © since 2007. Awesome Inc. theme. Powered by Blogger.